I showed Teh German an XKCD comic. 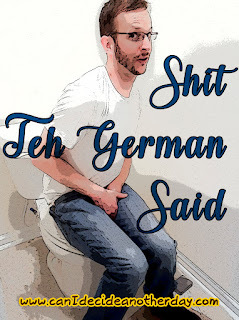 Teh German (tG): That is so much text. Teh Megan (tM): The bag says baby spinach, but these are pretty big spinach leaves. tG: It's more like teen spinach. tM: You read my mind! Except for when it comes to filling up the dog water bowl. tG: Yeah, I'm not really good at listening. tG: I need to cut my toe nails. tM: Wow, you have talons! tM (to the dogs): I'm not feeding you until 6 because we're going to get back on routine in this house. tG (to the dogs): She's speaking German to you. tM (to Teh MD-AR on the phone): I didn't even hear him pull in on my own bike. How did I not hear my own bike pull in the garage? tG (overhearing me): Because it's a Ninja. Discussing the surprise on the 10th. tM: We're going home right? You're not going to kill me or anything? tG: I've had many chances. But you know how lazy I've been lately. Discussing Disney on Ice (the surprise on the 10th). tM: We could have dressed up and worn our fairy costumes from the Disney run! tG: I'm not sure a grown man dressed as a fairy would be a good idea at a children's event. On Thanksgiving, as Roux tears a stuffed toy apart. tG: Looks like Roux is getting some stuffing too! tM: I was thinking 'Oh my, when did he get so old and fat!?" tG: And yesterday was Thanksgiving. Seriously you two are hilarious. The ninja & fairy ones made me laugh out loud. I love this! Also, why do I feel the hubby could do this with crazy stuff I say? Ooops!
" I'm not sure a grown man dressed as a fairy would be a good idea at a children's event." - hehe - and also, good call. I mean that sounds like a great way to make friends!